Glenhaven Youth Ranch operates in the heart of the Ouachita National Forest in central Arkansas. Young people from across the United States reside at the Ranch. Glenhaven Youth Ranch is a long-term residential care facility for at-risk young people. For over twenty years, they have provided help for teenage boys and girls with behavior problems resulting from abuse, neglect, abandonment, and dysfunctional homes. Glenhaven's mission is to provide an environment and the experiences needed for at-risk young people to succeed in life by becoming responsible family members and citizens. Glenhaven provides a safe place for these young people to heal, grow, and find hope. Trust, between residents and staff, is built by developing mentoring relationships which occur in a family setting. Through these relationships, the staff can share truth based on the Word of God and the love of Jesus Christ. Glenhaven Youth Ranch is a non-denominational, faith-based organization whose goal is the improvement of the emotional, educational, spiritual and social health of each young person. This goal is realized through the combined efforts of loving Ranch Parents, devoted teachers, and a dedicated support staff. The young people are taught that God wants their lives to reflect the inner peace that our Lord demonstrated. During His existence on earth, He overcame every slander, persecution, stress, and test that the world and the devil launched at Him. These young people can be overcomers in life instead of being victims. They can glorify God by learning and using His system. The philosophy of the program is a strength-based approach. That is, through education, projects, special events and a strong family unit each young person's strengths, talents and abilities are assessed. Then, staff offer hands-on experience though which a young person develops leadership and critical thinking skills. Church and Biblical training are an integral part of weekly schedules and are the foundation for the ministry. Each young person lives in a home with a set of Ranch Parents who provide a loving family environment. Within this home, they learn the dynamics of a functional family and have the opportunity to observe strong role models. 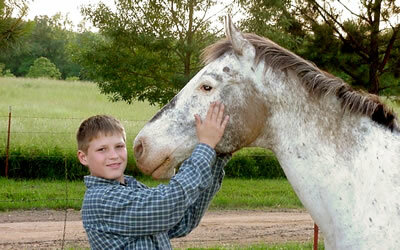 While at Glenhaven, young people receive equestrian and livestock training. In addition to academics, they are given vocational instruction in areas such as woodworking, mechanics, and machine work. Opportunities to learn about music and art are also available. Each young person is looking for answers to life's tough questions. They must learn that in the midst of the problems and hardships of life they can find genuine tranquility, contentment, and orientation to reality. By discovering the ultimate problem-solving perspective, and through occupation with our Lord, they will find peace and stability in their souls. To have an average of 40 at-risk boys in residence. To extend the ministry by sharing our experience through marriage and family training in churches, seminars and group settings. To upgrade the facilities with capital improvement funds from foundations that would allow us to accommodate the 60 boys and girls in the next five years.